What kind of experience would your healthcare practice offer if patient feedback directly influenced the compensation and rewarding of your team? Healthcare practices and agencies of all kinds aren’t an exception to the idea of applying continuous improvement, and one piece of the consumer journey puzzle that many still need to improve upon is the digital experience. 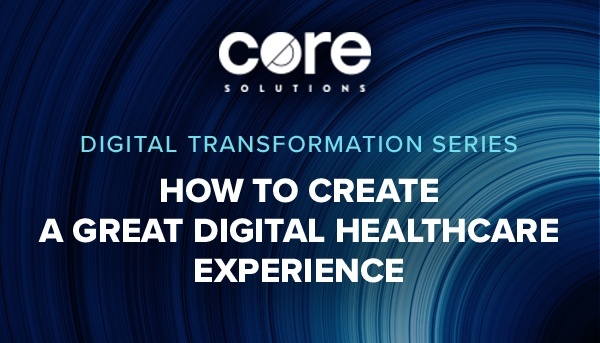 Creating a great digital experience is essential to differentiating your healthcare organization, staying competitive, meeting real consumer needs and surviving over the long term. Try adding some of the effective tactics below to your business-building toolbox to give shape to an exceptional digital healthcare experience in four major areas: the referral and intake process, assessments and planning, service delivery and discharge and post discharge. Want more tips on how to make all things digital a more important part of your healthcare organization? View the infographic below, Taking Healthcare Advice from Amazon & Zappos, to learn what makes these retailers digital experience experts, discover five factors that shape a great digital experience and start better serving your patients today. Creating a great digital experience starts from the inside. Make the switch from paper to digital or explore the advanced features of a new EHR with a partner like Core Solutions. Request a demo of our EHR solution below to get to know our platform and how our team is working toward a better future for healthcare organizations and their patients.